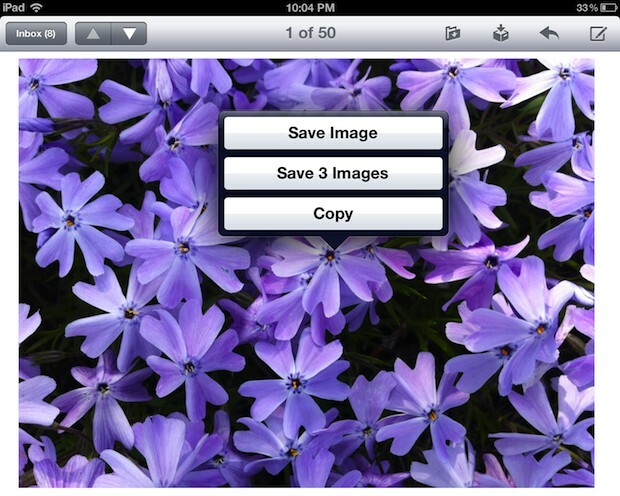 Saving pictures from websites or emails on to the iPad or iPhone is very easy once you learn how. This may be a bit of a beginners tip, but after fielding the question multiple times from relatives and even seeing it popup in comments on wallpaper posts, there are clearly a fair amount of people who aren’t aware of how simple the process of saving images directly to iOS devices is, and that’s OK, we’ll teach you! An image saved from the web will turn up in “Camera Roll”, in the Albums or Photos view, just like any other picture stored on the device, and just like a photo taken with the camera. Thus, you just need to launch the Photos app and look at the most recent additions to find your saved pictures. You’ll find this process is the same on all versions of iOS and on any iOS device, regardless of it being an iPhone, iPad, or iPod touch. Older devices may have an earlier release of system software which makes it look a little different, but the feature to save a picture from Safari is the same. 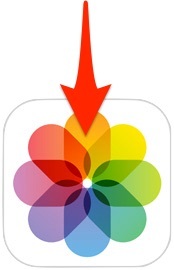 The saved picture will always be in the “Photos” app of iOS as well. Saving photos from Mail is basically the same, but has the added bonus of allowing you to save a group of pictures that were sent via email as attachments. 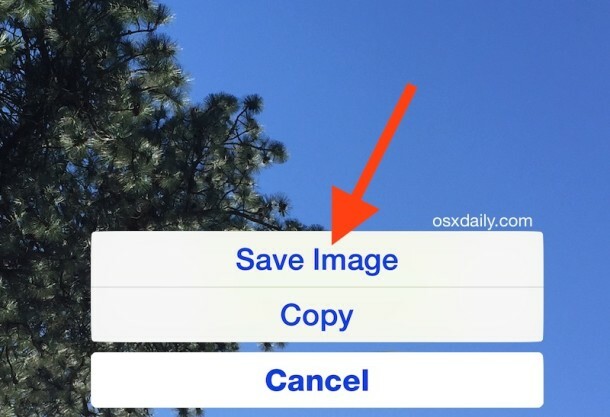 If there are multiple images, you’ll find a “Save All Images” button available. The “Save All Images” button is by far the quickest method if there are many pictures attached to a single email, though if you’re on a cellular plan without unlimited data you may want to consider whether or not to load them all now or when connected to a wi-fi network since photos can end up being quite large. Again, this is the same on all devices and all versions of iOS, though it can look a little bit different depending on what software version is running on the iPhone or iPad. The function, however, is identical. Once the pictures have been saved to Photos you can perform basic photo editing on them using the built-in tools, which allow for things like rotate, red eye reduction, and cropping, or even adding filters to stylize the image(s). The pictures can also be modified with third party apps at this point, whether it’s something like the excellent Snapseed tool, Photoshop, Instagram or iPhoto. Be aware that having pictures stored locally will count against the free iCloud backup capacity and will be listed under “Camera Roll”, unless specified otherwise in iCloud backup settings. Photos can also take up quite a bit of storage capacity, so it’s a good idea to regularly back them up to a computer or hard drive if you’re looking to conserve space on an iOS device. Thanks for this tip. This is a beginner level tip I hadn’t figured out yet. I have 1 question though. Once the picture is saved to the roll I put it in another roll so it wasn’t in with everything else. But when I tried to delete it from the main roll it said it can’t be done without deleting it in the other folder as well. Am I understanding correctly that you can’t move the pic, only paste the link in another folder? Yes, unfortunately iOS has basically no file management, if you’d even call it that. This may change come iOS 6 though, we will see. I was saving thing from pincrest and then I updated my I pad all my pictures vanished and now when I tap the pic only thing that comes up is copy, tap that but the pic doesn’t show up in camera???? Do the pics lose resolution by saving it this way through email (click and save image)? No, the pictures will download from email or the web at their original resolution. The compression or resolution loss typically comes from the image format itself, like JPG, PNG, TIFF, or GIF file. Hello! I can’t save any picture when I use pop up “save image”. I can’t find image anywhere. But is work for two weeks ago. Please help. I am having the same problem as you did before. How do you manage to fix the problem? Yes please tell me how you figured it out. Mine was working fine and now I can’t find saved images anywhere. I saved a picture but its not in the photos app. What do I do? How do I find the picture? The saved picture will always be in the Photos app. Go to Photos > Photos view, or Photos > Albums > Camera Roll, and look at the last pictures in the camera roll to find the image you saved to Photos app. Sometimes, Photos app takes a little while to display a saved picture, in that case, you can quit Photos app and relaunch it to get the picture to appear immediately as a thumbnail in the photo screen for iPhone and iPad. I am having the same problem. It says it is saving to drive. I have no clue where the drive is. Also how do you quit and relaunch? Same problem here..seems like every new software update something gets messed up..I’m holding down on pictures..nothing ..so I go to top right and click on box and go to save image still NOTHING ..very frustrating..no pictures are saved. I’ve totally shut down, u name it I’ve done it..do you have any other idea what could be set wrong? I have the iPad too… When I want to save pictures I have no problem I understand tap twice and save image… However email pictures when I tap it highlights and only the word copy pops up… Needless to says that doesn’t save the image. Any suggestions ? Don’t think you read my question Matt… I am aware of how to… My question is why in emails that doesn’t work. If it is a picture in an email that was sent without a download, no place to download said picture… When I tap I only get the word copy … Save isn’t a choice. Hi Elaine, it is possible that your version of iOS is dated and does not include the feature? What is your iPad or iPhone? And are you using the Mail app or a different mail client? Thanks for the help… I finally figured out what I was doing wrong. I hadn’t added google app… I was using my gmail through safari… Once I downloaded the app for Google, everything started working just fine… Thanks again for the help I received. New to iPad had windows for many years. I know. Same problem. You tap the reply button and a menu comes underneath it. One of those buttons say ‘save image’. Open photos, and it should be on your camera roll. Elaine, you must read the article where it says “Tap and HOLD” then choose “Save Image”. That means tap once and continue to hold the image. Tap and hold is not tapping twice. In fact, there is nothing at all about tapping twice mentioned anywhere except by you, so despite what you say, you do have a problem understanding, as there is nothing in the walkthrough that says to do that. Follow the instructions and you will be saving your pictures to the iPad from email, exactly as described. That is my suggestion for you. I know how to do this but whenever i do, the picture is always very pixelated, im on the iPad mini. Do you know why? Or have any tips? Can anyone help me find a website from a saved image? What does that even mean? You want to find out where the original website was that a picture was saved from? You may be able to do that on a Mac, but very difficult on an iPhone or iPad unless you can find it in Safari history. i would like to know how to save pictures from website or email but keep them in smaller size rather than its original automatically. i dont want to manually set each picture to smaller size. even now i dont see in setting to save pictures in 640 or 800 or 1280 or even smaller size. 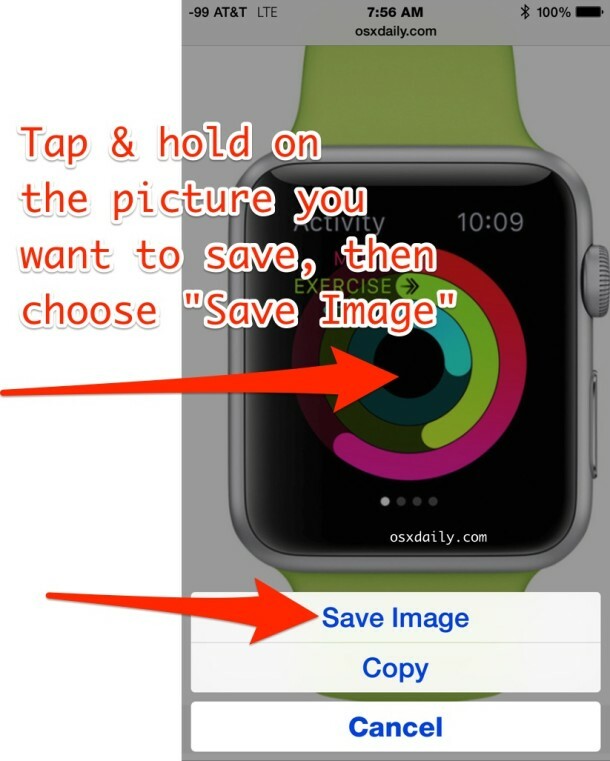 Your solution is to save the image to your iPhone or iPad, and then to manually save the picture at a smaller size, or you can crop the image down once you have saved it. That is your solution and it does exactly what you would like it to do. If you don’t want to do that, you won’t be saving the pictures at a smaller size because they always download at their original size. Thanks! !But how do you download the moving images it’s not a video the images just move.I want to download on but can’t all I see is the picture not the Moving with image.Can You help me? That’s an animated GIF, just tap and hold on an animated GIF and you can save those from Mail and Safari too. Why do we have to ask these questions via the internet? It’s like secret information that only a small private club knows about. If Apple is so intuitive why do so many people need to ask these kind of questions. I’ve just done the upgrade and it will no longer ‘Save Image’. Share… which does NOT include save image! WTF!?! This was something I used at least three times a day. If there’s no fix, fast, then I’m going back to 9. It’s definitely a problem since nice the update On my I pad just like you have discovered too so how can we go back to a previous version before the update and surely the update is important for other reasons such as antiviral protection etc ? I have exact same issue and it’s a huge issue since I use this all the time. Also still looking for a solution. Okay so a while back I sent myself some pictures from photos on my iPhone 6 to my yahoo email, I tried to look at them in my email but they just pop up as grey squares, my phone has been updated, I’ve tried saving them to see if they’d pop up in photos either way but they don’t. Someone please please help. My concern is I have pictures on Facebook messenger. I tap and hold but don’t get the features to save or copy. The pop up menu to save images no longer shows on the ‘new’ harder to use iPad. Yes it does, this works the same on all iPads ever made. You have tap and hold on an image in Safari on iPad and then choose “Save” to save the image. When I hold my finger on the attached picture it doesn’t offer me a save image but share, open in a new window and copy. How do I save the picture?